We wanted a different design for Addis' Zoo animals nursery theme that was really bright but gender neutral. 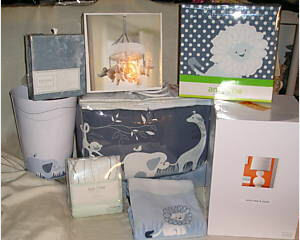 With this in mind, we chose the Lambs and Ivy Zoofari zoo animals baby bedding set. The pattern of the fabric was used inspiration for the wall decor and other zoo theme nursery decorating ideas. We have many more pictures of Zoo Animals Nursery Theme designs. It was also invaluable in putting together the exact color scheme that we had in mind for the room. Go here to see more . We chose a bright shade of yellow for the wall that would complement the greens in the bedding set. Our artist friend, Antar, took the animals from the pattern and really brought them to life in a mural that he hand sketched and painted. We made the request that he highlight our baby's name as part of the jungle nursery wall mural painting and that was managed by integrating painted, wooden wall letters spelling her name that are arranged among the zoo animals in the nursery's mural. Another goal that we had was to give the baby's room a cozy ambiance by using the unique architectural details that were already in place in the room including the hardwood floors, exposed brick and recessed lighting. It's not clear from the zoo nursery room pictures but her bookends are antique wood cutters from the 1800s. I love the way that your friend painted the characters from your zoo animal nursery bedding set on the walls! What a great friend! And he did a beautiful job. If you would like to send more pictures I will post them for you. I would love to see a close-up of the blue baby elephants and monkeys on the walls. My favorite memories from childhood are of visits to the zoo and that's why I chose this theme! Join in and write your own page! It's easy to do. How? 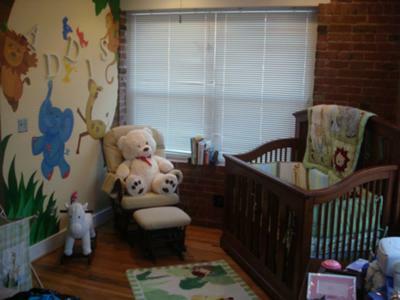 Simply click here to return to JUNGLE NURSERY PICTURES and DECORATING IDEAS.